I came to know that we can write scripts in Windows to by creating batch files, What is meant by the batch files in Windows? How to create a batch file? How to perform an specified function using Batch File in windows 7? How to change the default editor for a batch file in Windows Vista? Getting an error "'powercfg' is not recognized as an internal or external command operable program or batch file"
Duplicate Excel Files creating automatically on Windows 7 desktop. What is the meaning of Digital signature in windows 7? Re: What is meant by batch files in Windows OS? How to create a simple batch file? Batch files are nothing but a text file with a list of commands to execute with .bat extension. So what all commands which you run in the command prompt can be executed by creating the batch file. If you are set of commands which you want to run again several time then you can write it in a batch file and execute it in the command prompt. STEP 1: Open text pad from start or simply press Windows key + R and type notepad and press Enter. STEP 3: The command echo will output the text as “My first simple batch file” and the command ipconfig /all will show your network related informations. STEP 4: Now save the file as simplebatch.bat in your desired destination. STEP 5: Open cmd from start or press Windows key + R and type cmd and press Enter. STEP 6: Now navigate to your folder path and type the bat file name as simplebatch.bat and the commands will be executed. In this way you can create your own batch file with your own set of commands and execute them accordingly. Batch File can be used to make a set of Commands to execute in windows operating system.If u want to do series of activities in Windows then u can add all the commands in a batch file and it will executes all the commands one by one.Batch files are simple text file which will have some basic dos command and u can also run the system command that u can run in Windows command prompt. These are the text files which are opens in the notepad, you can able to create it by using the notepad. and save the file as "Name.bat" in your known detination. now open RUN and type the cmd and press enter. *It Can Be Executed by Command Interpreter. *Simply Type Batch File Name as batch.bat and then Commands will be Executed. When you are executing the batch file. You can just write the name in the command prompt.Even if there is an executable file with same name then also the batch file will be executed. Batch Files are list of Command Line Instructions that are batched in to a single file. It is very easy to use. It is saved with an Extension of '.bat'. Sample Batch code which clears Cookies on your Hard Disk when ever you go Online. 3) Save it as anyname.bat (aware that no .txt extension after .bat). 4) Double Click on the Saved File. ECHO is same as "Print". Pause is to continue when ever the User wants. Batch files are nothing but the files which are created as a support for the existing files in the system and also you can create the batch files in your computer by making them as default files of the drives and also the proper settings for the batch files to create them in your computer and as well as your windows OS. Batch file are script file or text files which contains series of command to be executed by command prompt,which usually have .bat extension. double click the file which you have saved,your`s batch file will open. similarly you can write any command to the batch file an dit will get executed. Batch files are used to create the commands which helps to run in sequence when the batch file has*been executed. It can be used to run commands an deleting series of files, moving files, etc. It does not require any special skills. It can be created by users who have a basic understanding of MS-DOS commands. It also can be run commands or programs through the command line. This batch file contained all they commands,. Batch File can be used to make a set of Commands to execute in windows operating system. If u want to do series of activities in Windows then u can add all the commands in a batch file and it will executes all the commands one by one. Batch files are simple text file which will have some basic dos command and u can also run the system command that u can run in Windows command prompt. To create a simple batch file just open the notepad, write some basic DOS commands such as cal, echo "your name", cal, dir ,etc. Save it with the extension .bat. double click the file to run. it will run all the commands entered in it. Batch files are regarded as scripts or simply text files. they are a set of commands which functions is to execute programs. they are mainly used when there are many programs or files to be executed. sometimes batch files are termed as dos files as they work with commands like the dos.in order to run the batch file, first you need to open the notepad and then type the following commands,ECHO OFFDIRPAUSECLEANMGRafter gave any name followed by .bat and then save it. now, when you double click the name you have saved it start functioning with all the commands you have typed. A batch file is an unformatted text file that contains one or more commands and has a .bat or .cmd file name extension. When you type the file name at the command prompt, Cmd.exe runs the commands sequentially as they appear in the file. You can include any command in a batch file. Certain commands, such as for, goto, and if, enable you to do conditional processing of the commands in the batch file. ECHO OFF is DOS command and while running the commands in the command prompt it will not show the command that is executing. Dir will just list the files and folders in the directory. Pause will wait for the user input, press enter key of other key to continue. Ipconfig is a Windows command which will display the network configuration of the system. Cleanmgr is a Windows utility command which will open the disk clean manager Window. If we want our OS to perform a series of operations in System, then we compose a Batch File. Batch file is simply a list of commands written in a text file. You can create a Batch by simply writing DOS Commands in Notepad and saving it to .bat format. In this way, your Batch file will be created and you can access it by opening cmd. For opening cmd, open Run Command and type cmd followed by OK.
Batch files are special files, often called scripts, that allow you to run programs from the DOS Command Window. Batch files are useful for storing sets of commands that are always executed together, in sequence, because you can simply enter the name of the batch file as the "command" instead of entering each command individually. 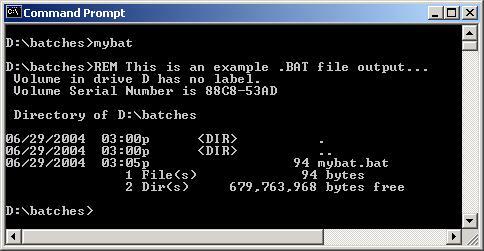 In DOS, batch files end with a .BAT extension. The process of creating them is often called DOS batch scripting. This batch file contains two comments (or remarks, indicated by "REM") that just provide documentation for either the author or the user of the file. The first one is "echoed" to the screen because it is embedded inside two @ECHO commands that first turn on echoing and then turn it off. Everything between the @ECHO commands is displayed on the screen during the script's execution. After the second comment, there is a simple DOS "dir" command which, as usual, lists the contents of the current directory. Note that the individual commands or comments are separated by newlines, that is, pressings of the Enter key. Running the batch file executes the commands in "mybat.bat" sequentially. Double-clicking the batch file icon (see below) will open up a DOS Command Window, invoke NetMailBot within it according to the batch file, and then close the window when everything is done. Depending on how short your script is, if you blink, you might miss it! Type: notepad and press enter. Once notepad is open, type the below lines in the file or copy and paste the below lines into notepad. Click File and click Save; browse to where you want to save the file. For the file name, type "test.bat", and if your version of Windows has a "Save as type" option, choose "All files", otherwise it will save as a text file. Once all of this has been done click the Save button and exit notepad. Now, to run the batch file, double-click or run the file like any other program. Once the batch file has completed running it will close the window automatically. Just like all MS-DOS commands, all batch file commands are not case sensitive. However, in the below listing we have listed all commands in all caps to help you identify what is a command and what is not. @ Does not echo back the text after the at symbol. This most commonly used as @ECHO OFF to prevent any of the commands in the batch file from being displayed, just the information needed. Note: This can be extended to %2, %3, and so on. :: One of two ways of adding remarks into the batch file without displaying or executing that line when the batch file is run. Unlike REM this line will not show regardless if ECHO off is in the batch file. :LABEL By adding a colon in front of a word, such as LABEL, you create a category, more commonly known as a label. This allows you to skip to certain sections of a batch file such as the end of the batch file. Also see GOTO. CALL This used to run another batch file within a batch file. When the batch file that is called is completed, the remainder of the original batch file is completed. Note if the batch file does not exist it will give an error message. CHOICE See running different programs for an example of how to use this command. Additional information and the syntax of this command in each version of Windows and MS-DOS can be found on our CHOICE command page. CLS Just like the DOS command would clear your screen. Additional information and the syntax of this command in each version of Windows and MS-DOS can be found on our CLS command page. ECHO Will echo a message in the batch file. Such as ECHO Hello World will print Hello World on the screen when executed. However, without @ECHO OFF at the beginning of the batch file you'll also get "ECHO Hello World" and "Hello World." Finally, if you'd just like to create a blank line, type ECHO. adding the period at the end creates an empty line. EXIT Exits out of the DOS window if the batch file is running from Windows. Additional information and the syntax of this command in each version of Windows and MS-DOS can be found on our EXIT command page. GOTO LABEL Used to go to a certain label, such as LABEL. An example of GOTO would be to GOTO END. For an example of this see running different programs. Additional information and the syntax of this command in each version of Windows and MS-DOS can be found on our GOTO command page. IF Used to check for a certain condition if the condition exists. If that condition exists it will perform that function. To see an example of this see running different programs. Additional information and the syntax of this command in each version of Windows and MS-DOS can be found on our IF command page. PAUSE Prompt the user to press any key to continue. REM One of two ways of adding remarks into the batch file without displaying or executing that line when the batch file is run. Shift command help and syntax information. START Used for Windows 95, Windows 98, and Windows NT 4.0 and above to start a windows application; such as START C:\WINDOW\CALC would run the Windows Calculator. Users running Windows 3.x need to utilize the WIN command. For example, WIN C:\Windows\CALC.EXE would run Windows and then Calculator after Windows has finished loading. Start command help and syntax information. What is meant by Defragmentation in Windows? Is it necessary to do it? How to do the defragmentation?